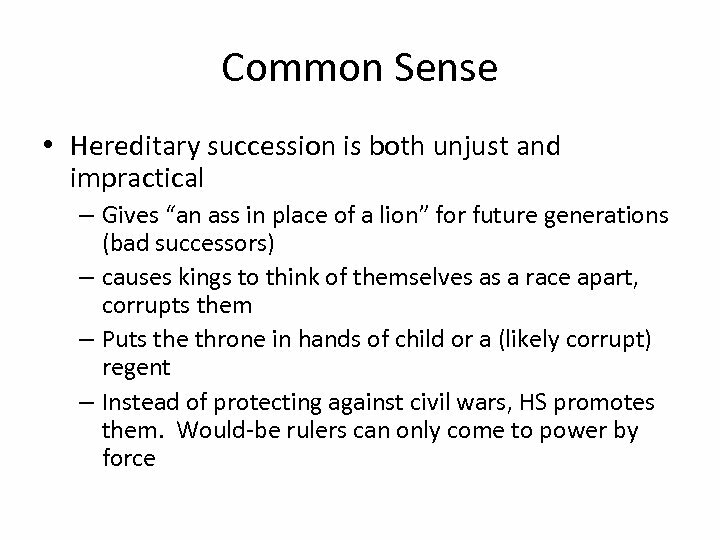 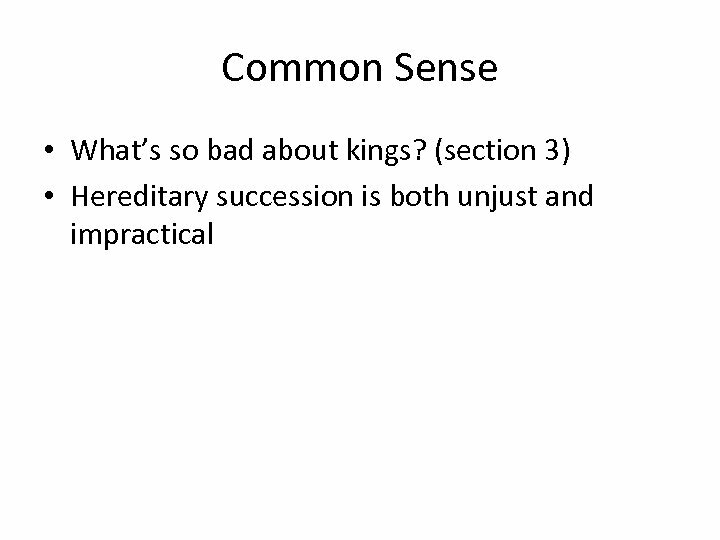 Common Sense • What’s so bad about kings? 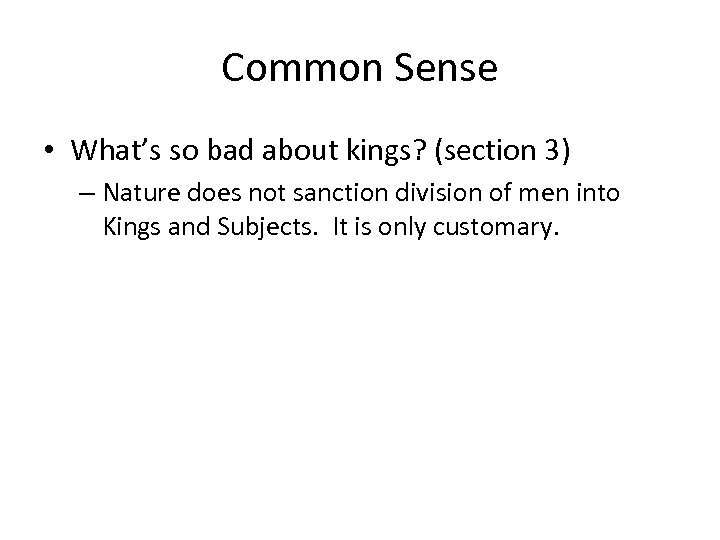 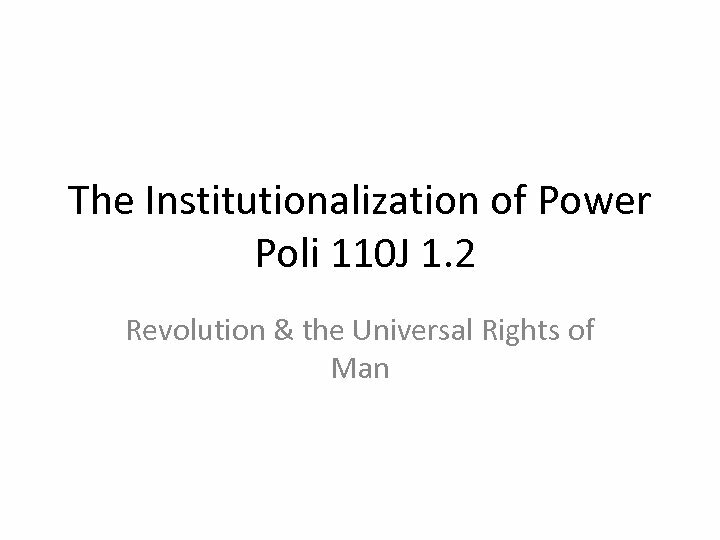 (section 3) – Nature does not sanction division of men into Kings and Subjects. 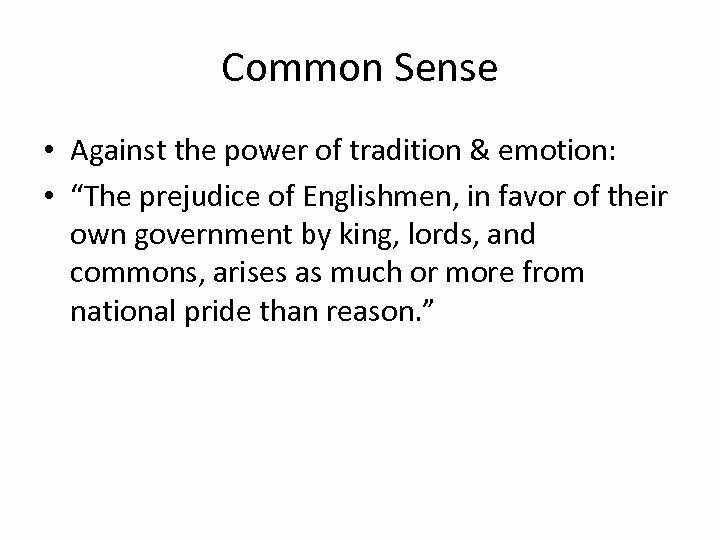 It is only customary. 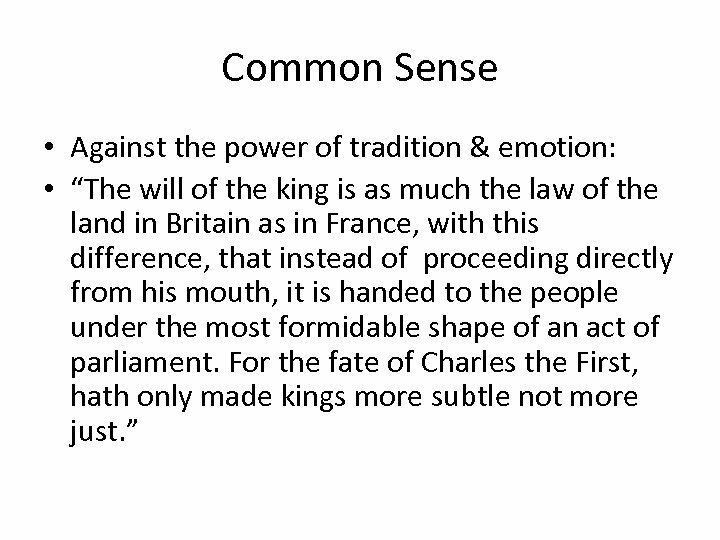 Common Sense • What’s so bad about kings? 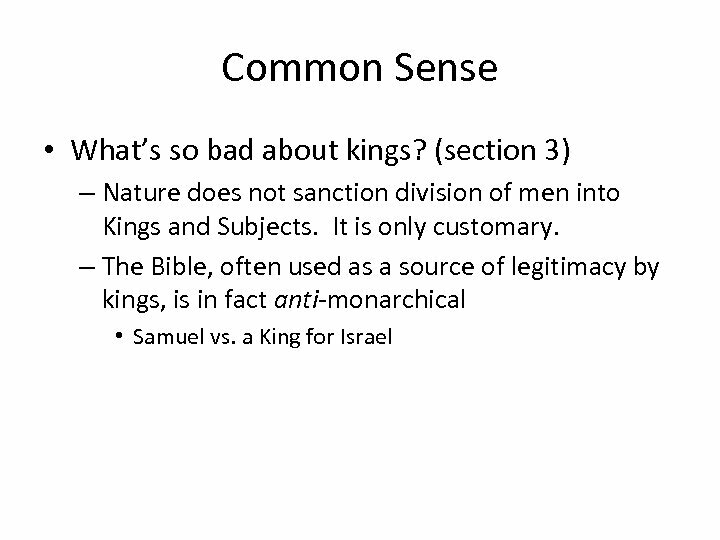 (section 3) – Nature does not sanction division of men into Kings and Subjects. 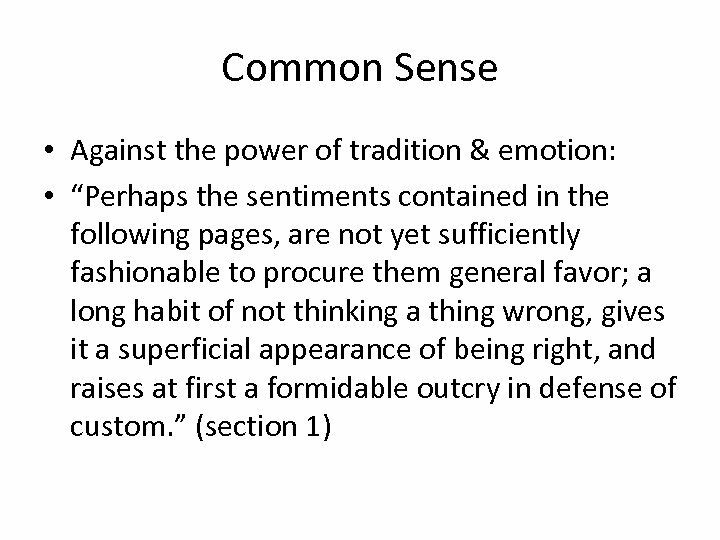 It is only customary. 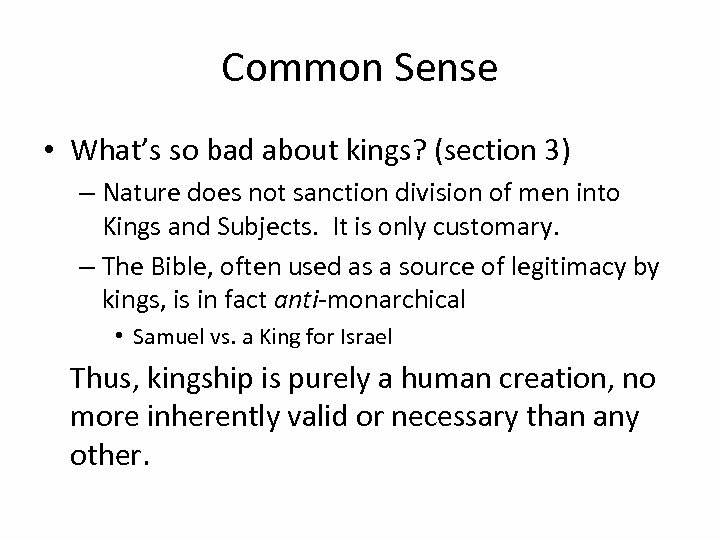 – The Bible, often used as a source of legitimacy by kings, is in fact anti-monarchical • Samuel vs. a King for Israel Thus, kingship is purely a human creation, no more inherently valid or necessary than any other. 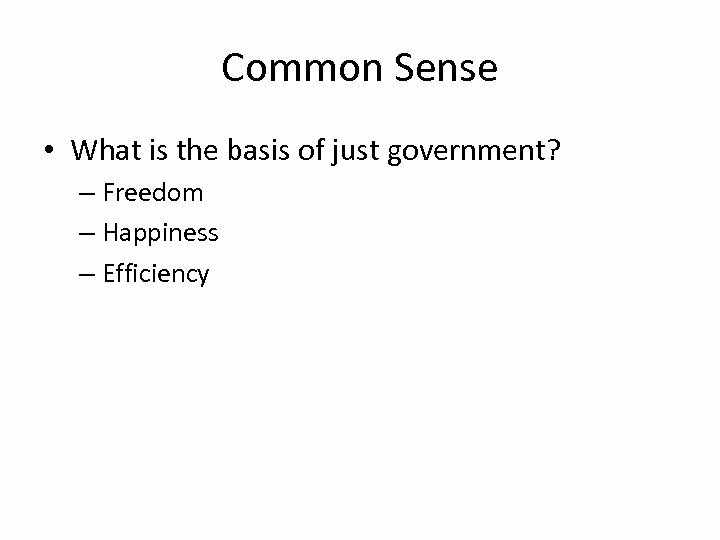 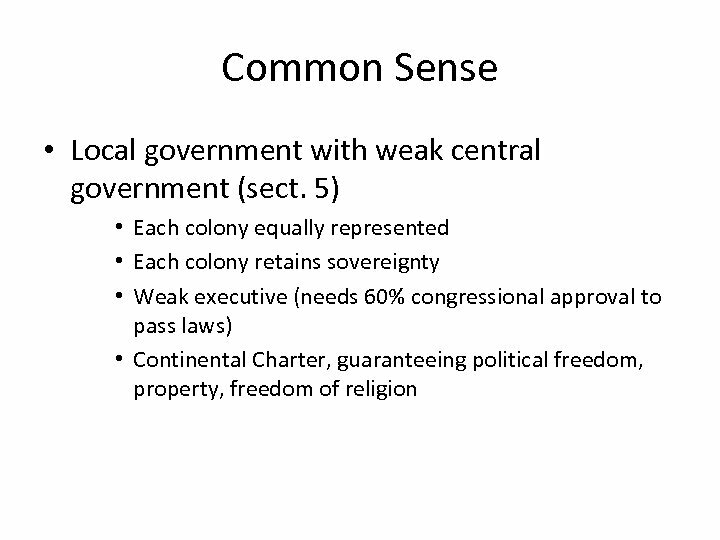 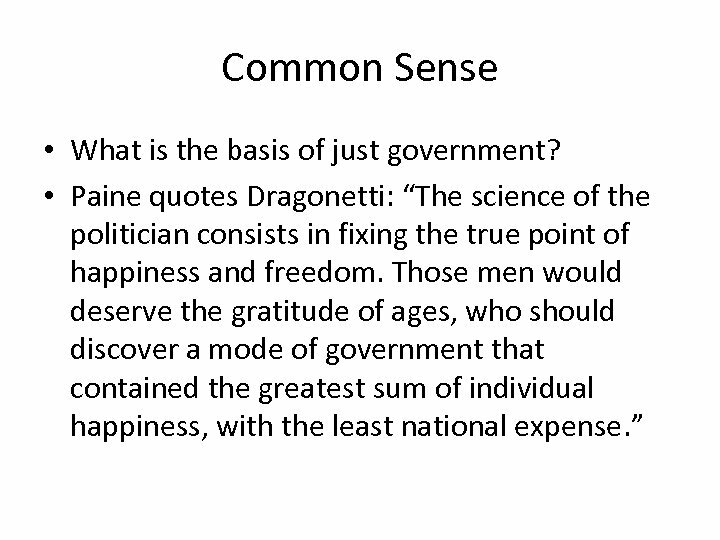 Common Sense • Why is independence necessary? 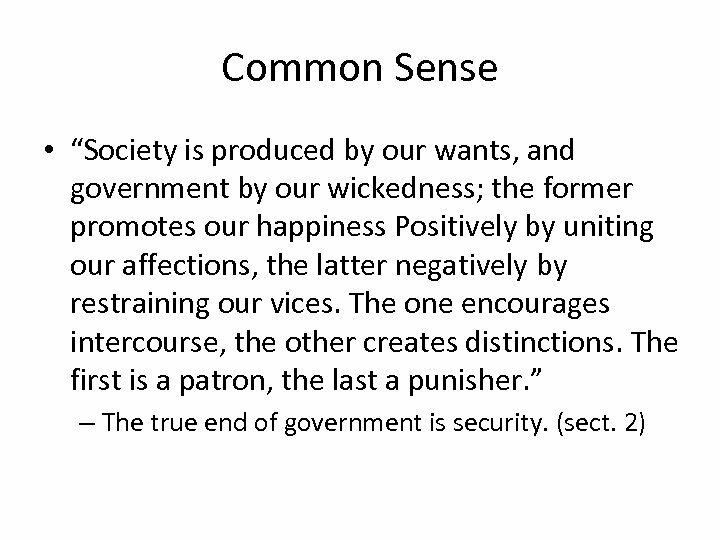 (sect. 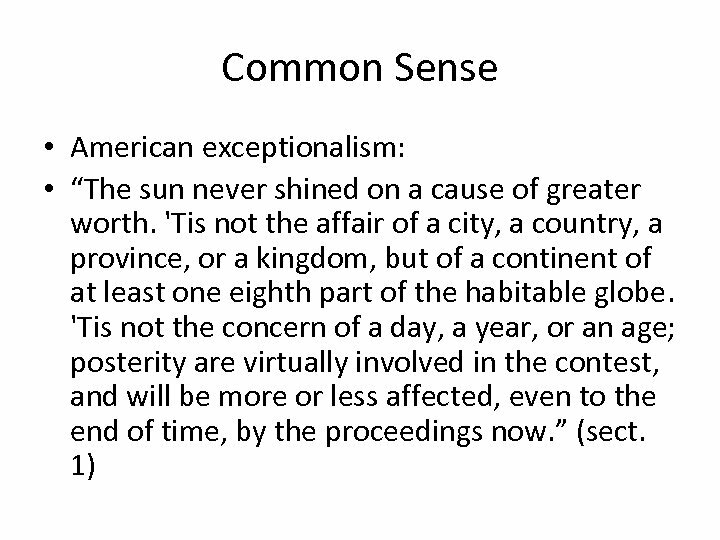 4) – England is violently oppressive, exploiting America for the good of England – England is too far away to govern America effectively, even if it wanted to. 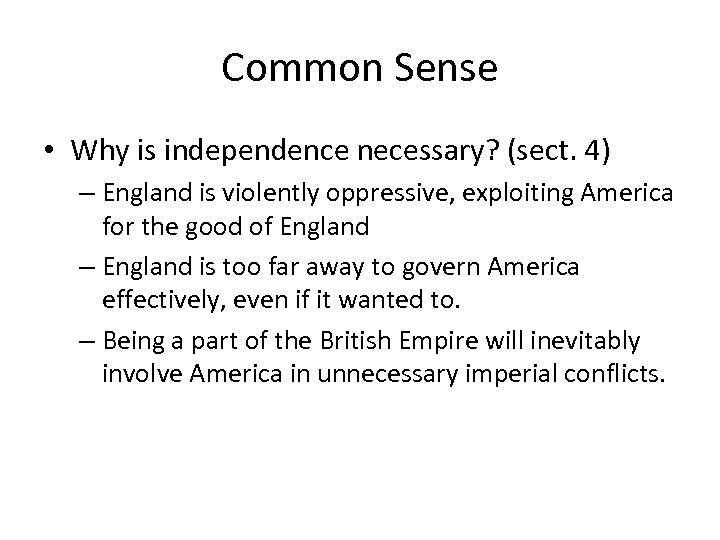 – Being a part of the British Empire will inevitably involve America in unnecessary imperial conflicts. 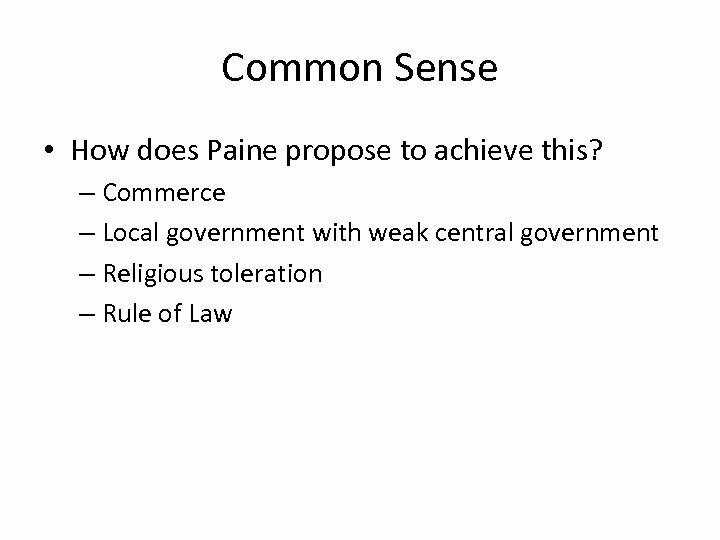 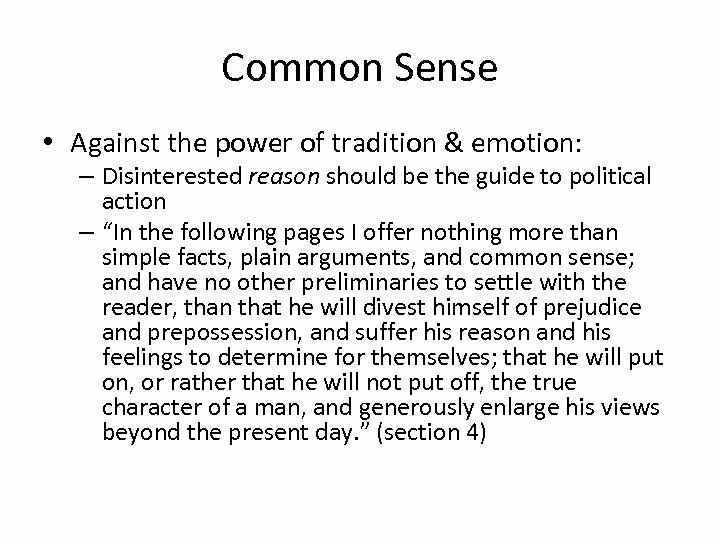 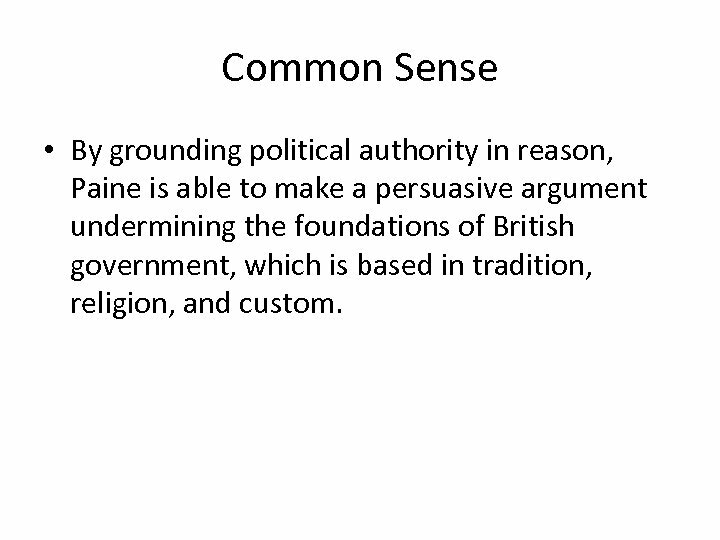 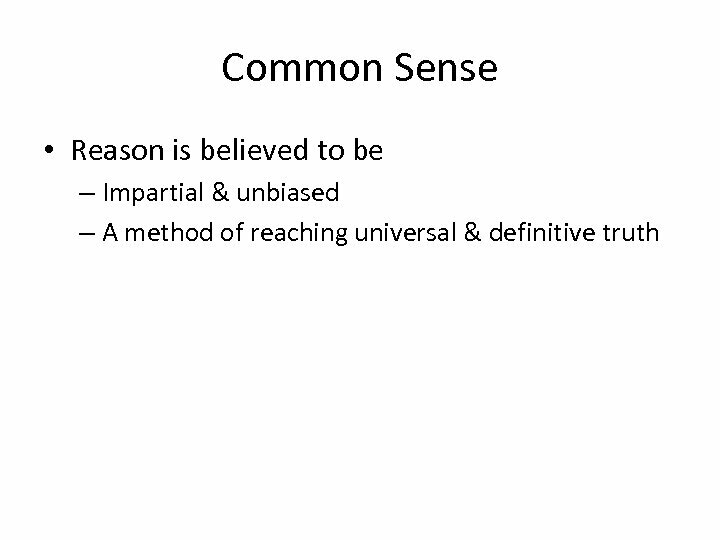 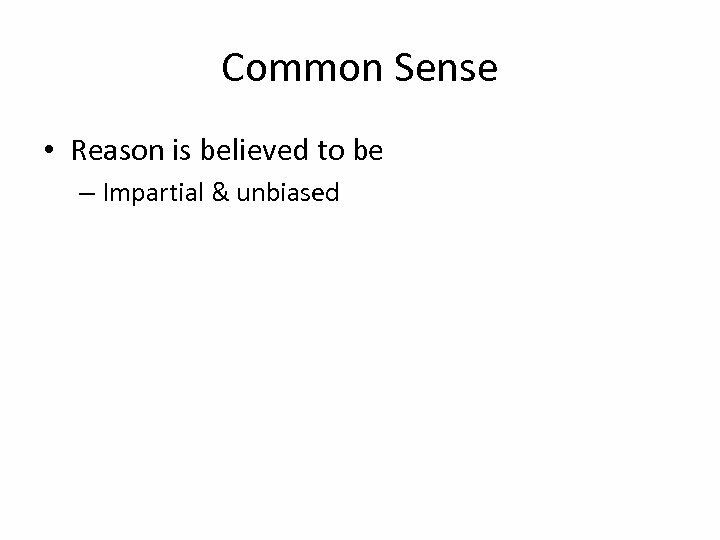 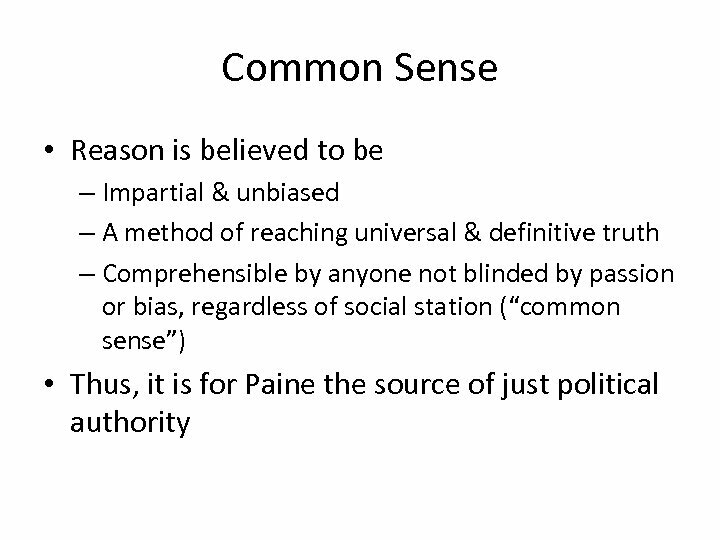 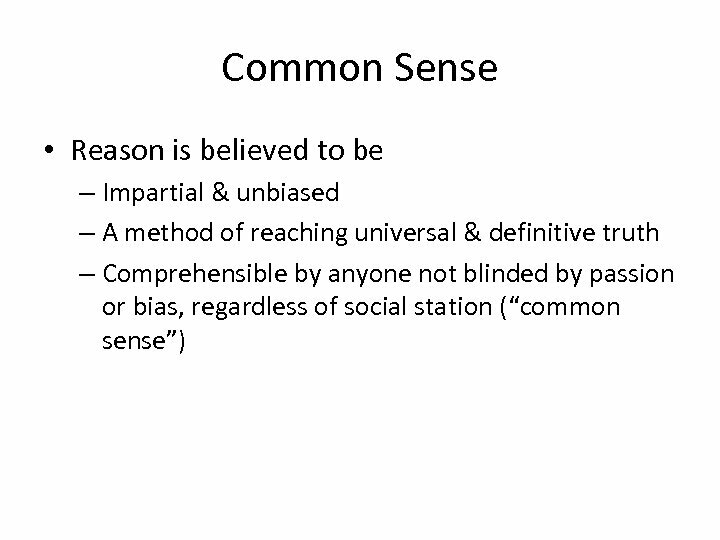 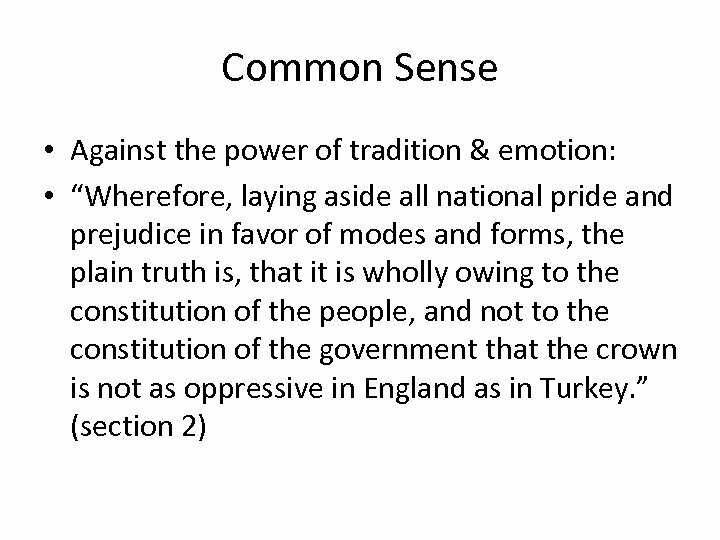 Common Sense • By grounding political authority in reason, Paine is able to make a persuasive argument undermining the foundations of British government, which is based in tradition, religion, and custom. 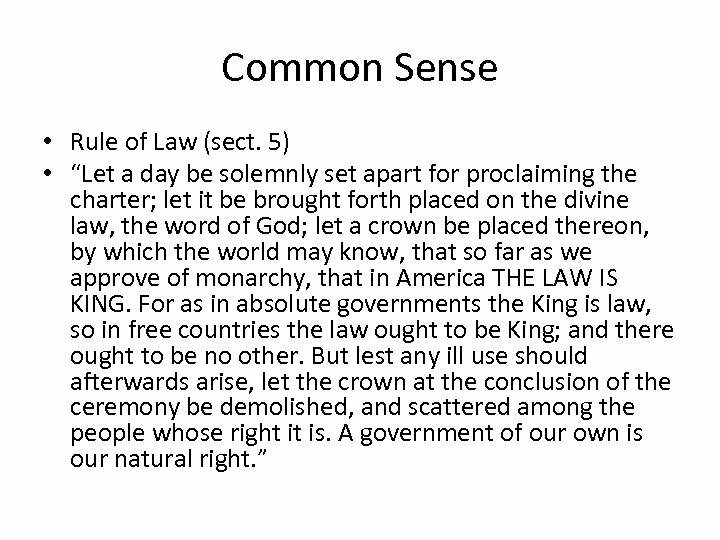 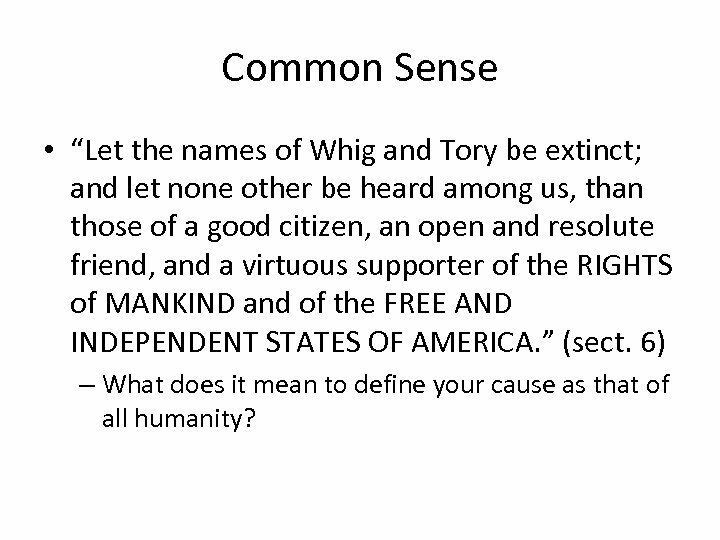 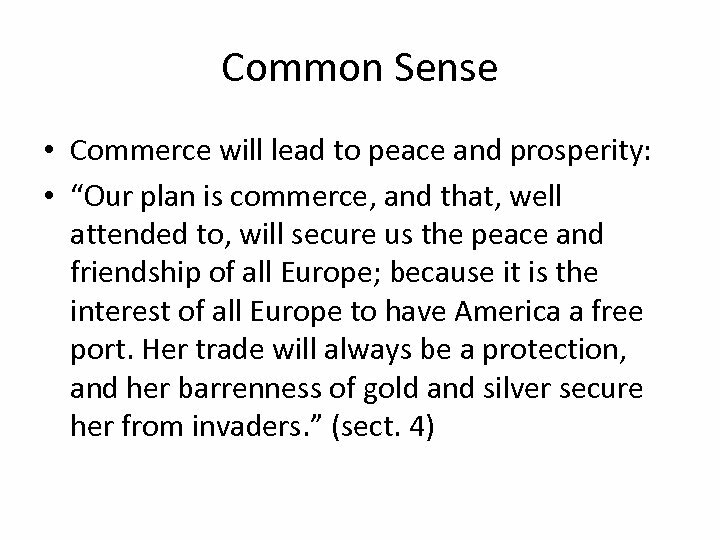 Common Sense • “Let the names of Whig and Tory be extinct; and let none other be heard among us, than those of a good citizen, an open and resolute friend, and a virtuous supporter of the RIGHTS of MANKIND and of the FREE AND INDEPENDENT STATES OF AMERICA. 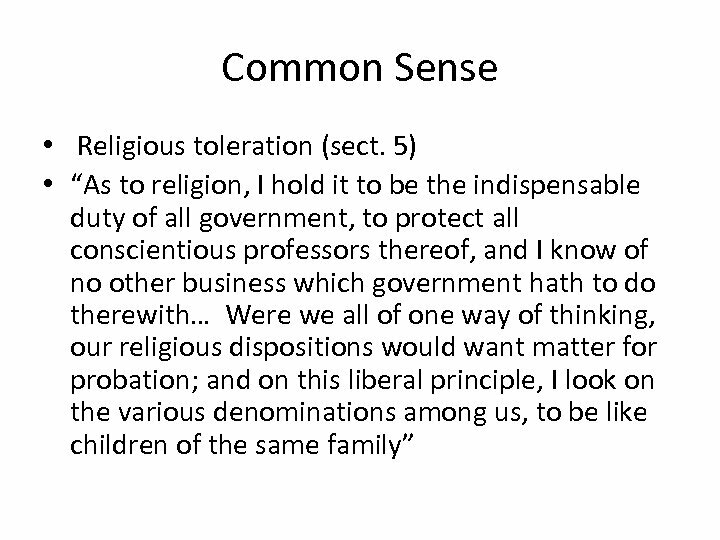 ” (sect. 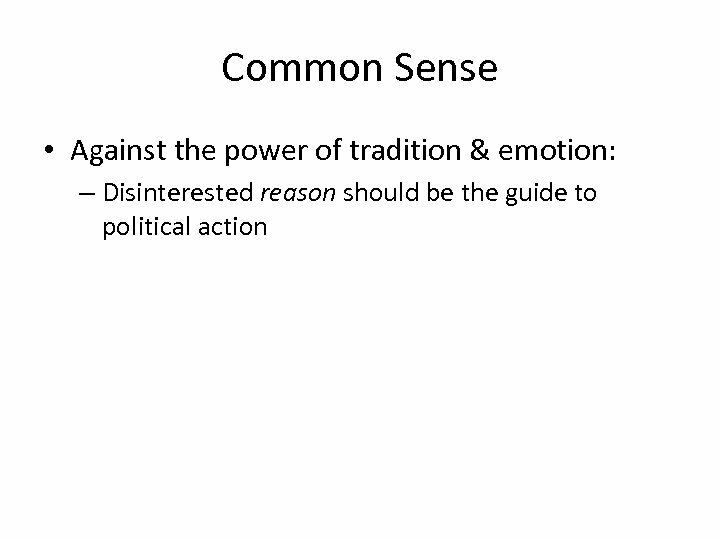 6) – What does it mean to define your cause as that of all humanity? 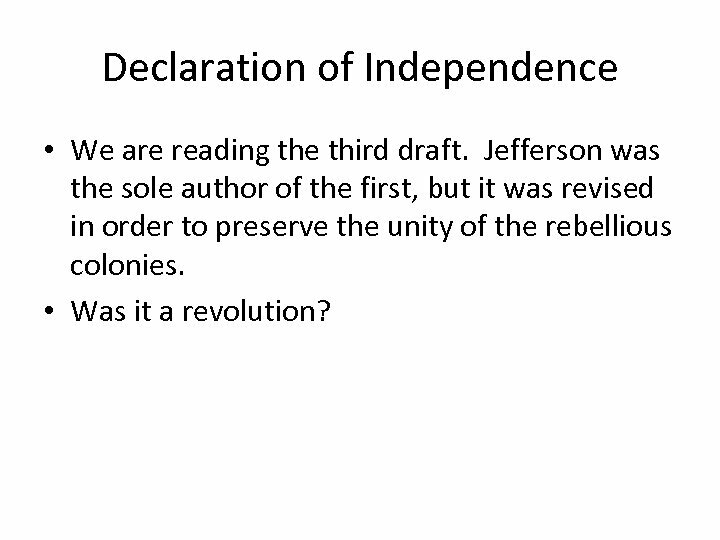 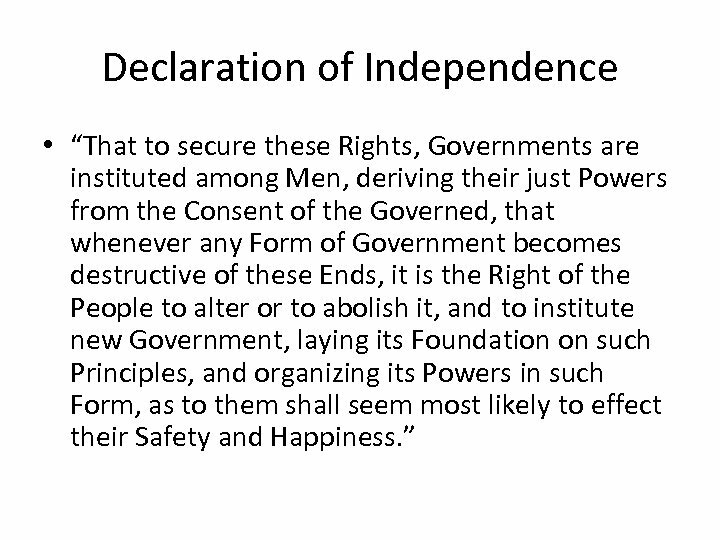 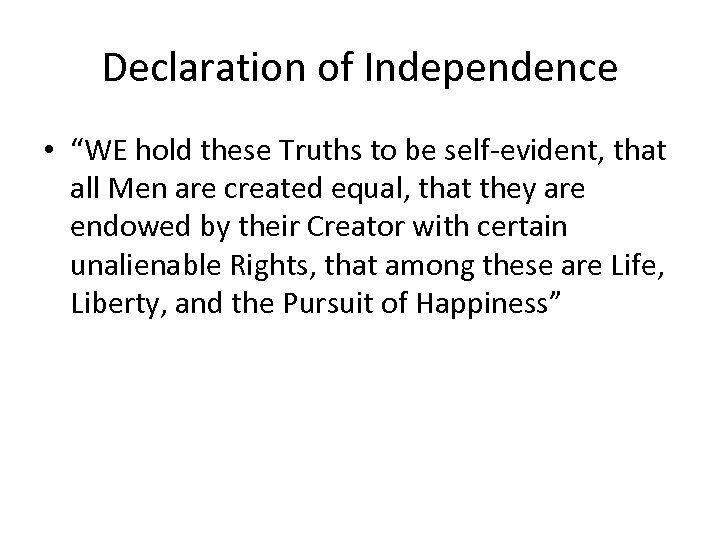 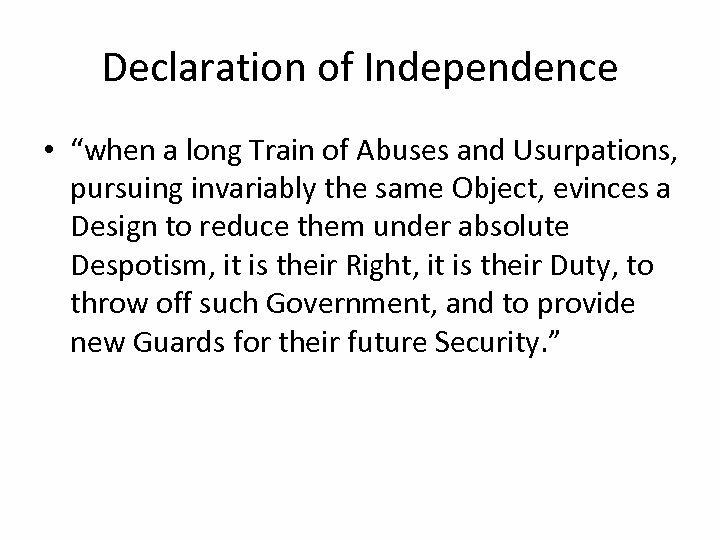 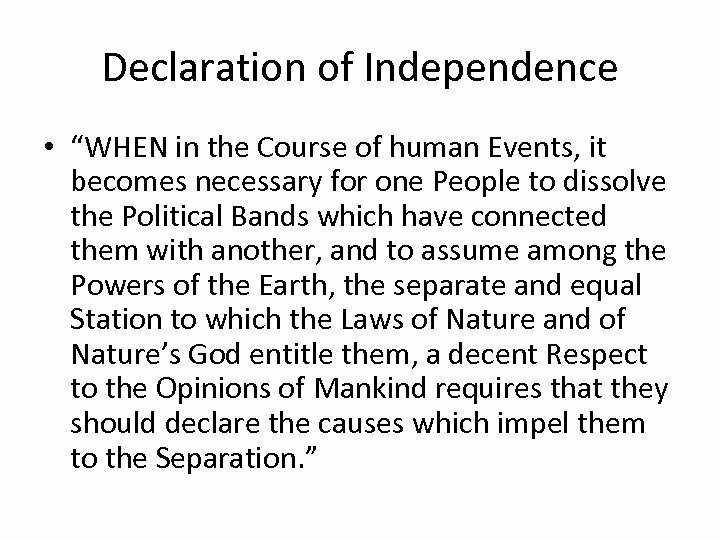 Declaration of Independence • We are reading the third draft. 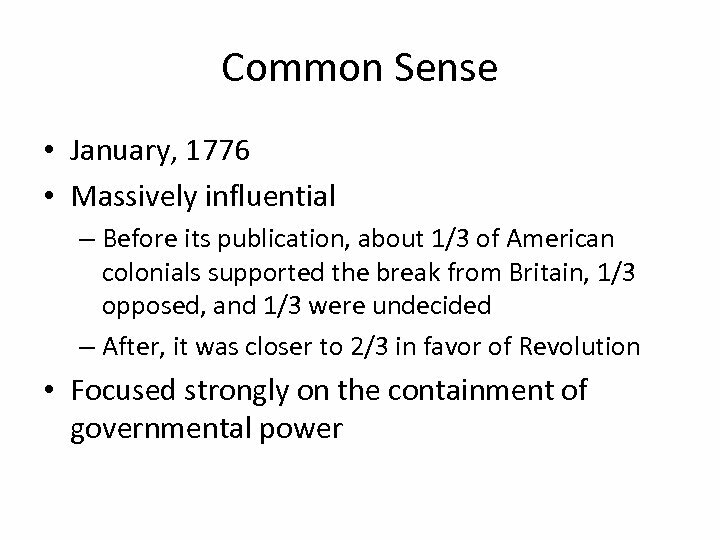 Jefferson was the sole author of the first, but it was revised in order to preserve the unity of the rebellious colonies. 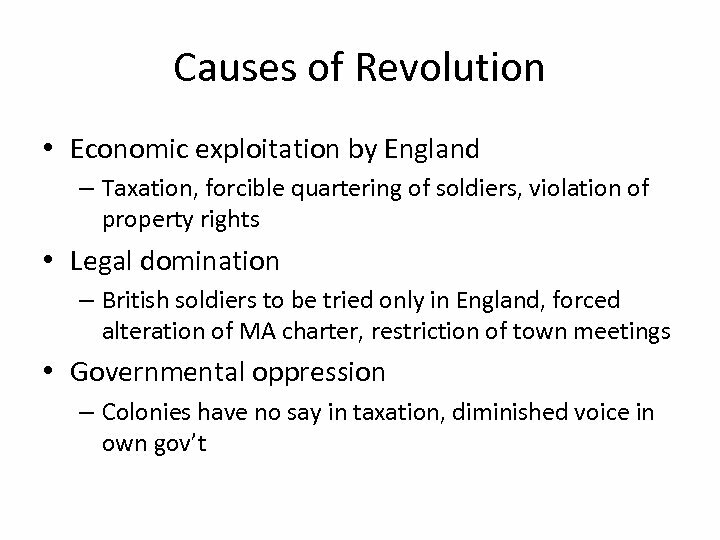 • Was it a revolution?